This post is part of a series called Documentary in Motion. While video technology is moving rapidly, the format of documentary hardly ever changes. You have your interview or dialogue for A-roll, and then everything else is B-roll. The interview format doesn’t change much because anything new or snazzy could distract audiences from the heart of a documentary, the story. So while there are amazing new ways to capture riveting documentary B-roll—with drones, gimbals, time-lapses, and more—the interview shot looks much the same today as it did half a century ago. It’s just too important a shot to mess around with. If you’ve ever kicked yourself for fiddling with the camera during an essential moment in an interview, you may never touch a camera again during the interview. And yet, we keep pushing ourselves to extract every bit of dynamic motion out of each scene in our documentary production. So what kind of camera motion can we create during the interview, while minimizing the risk of a ruined shot? The first thing you can easily do is simply take your camera off the tripod, and shoot your interview handheld or using a shoulder rig (or a chest support). If you want to infuse your documentary with energy, this will do the trick. Close your eyes and imagine watching B-roll sequences of beautiful camera movements, followed by brief three to four seconds of A-roll interview shots with slight, organic camera shake. Not handheld pans or tilts, but natural handheld moves that look like a what audiences expect a documentary to look like. It can give your interview an authentic feel, the opposite of a slick corporate vibe, and yet your image and framing can still remain polished. There are, however, major risks when going handheld or even shoulder-operated. First, you could be introducing annoying micro jitters that will be impossible to remove in editing. Or your subject could be slightly out of focus, since it’s harder to judge focus while your camera is in motion. Or consider that your Image Stabilized lenses could make the interview shot feel slightly wobbly or digitally stabilized, which could take away from the authenticity you’re shooting for. And finally, the handheld shake works best with on-axis, direct to camera interviews where the shake looks intentional, or motivated. The subject has an urgent message and the camera operator quickly recorded it. In contrast, in an off-axis interview with a subject-interviewer setup, where it’s clear to the audience that we're watching a production, a camera shake on the interview shot could seem really out of place. Adding subtle camera shake in Final Cut Pro X. My advice here is to try adding camera shake in your editing program first. There are plugins for just about every non-linear editor that can mimic camera shake, and they give you an opportunity to test the look out without committing your interview to this particular style. If you’re using a photo lens on your DSLR or cinema camera, it’s really difficult to achieve smooth zooms, so I wouldn’t recommend trying it during an interview. You can, however, experiment with quick zooms or crash zooms, as they can add a particular kind of energy to your interview shot that is impossible to replicate with a cut in post-production. You don't have to zoom in and out a lot—a little here and there can bring life to a long, static interview shot. If you have a camcorder or a lens with electronic servo zoom, then you may be able to utilize a push or pull zoom throughout your interview. The key here is to set your electronic zoom speed to the slowest setting you have. Slow enough that your viewers may not even notice the zoom happening during a long interview shot. The problem with too-fast servo zoom shots during an interview is that they’re very clearly noticeable, and they can be more distracting than helpful to your story. One problem you may run into when you're zooming in during one part of the interview, and zooming out during another part, is cutting those shots together. Later you want to use those segments next to each other, it might make for a really awkward viewing experience to see a push-in on the subject, followed by a zoom out. So for most documentaries, it’s better to avoid messing with zooms during an interview. You can still zoom and reframe at times when the subject isn’t talking, but try to avoid it during their replies. And then you can still add a slight push-in or pull-out zoom when you’re editing, using the Ken Burns effect or with animated keyframes. In fact, I read recently that "PBS Frontline" employs a really slow push-in on every single interview shot on their award winning programs. I'm sure if you started looking for them, you would see that the slow interview push-in or zoom-out is used in some way on just about every documentary. 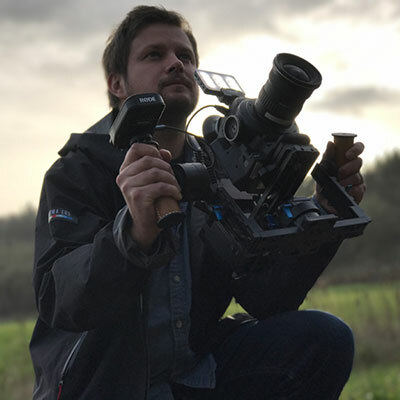 The most common approach to interview movement, at least with polished documentaries that look more produced, is to use a slider on either your main camera or a second B-camera off to the side. First thing’s first, if you’re going to put your one interview camera on a slider, you have to be absolutely confident that you can achieve a slow, smooth slide without bumps. Sliders aren’t perfect, which is okay during B-roll when you can re-do a shot a few times. But in a documentary interview situation, there are no do-overs. So you have to trust your slider to use it on an interview. Otherwise, a few interesting slide shots may not be worth potentially having bumpy and unusable interview footage when you need it. Second, if you’re only shooting with one camera, you can’t really use a slider on a direct to camera, on-axis interview. The camera sliding from left to right, as the subject faces the camera…it could look awkward. But with an off-axis interview where you’re shooting the subject over your producer’s shoulders, a slider could definitely add interesting motion in your edit, especially if you only plan to use a few seconds of interview shots throughout your video. If you want to use a slider during an interview, it’s more likely you’ll have a second camera on a slider, framed to the side of your A camera. You could have an assistant manually slide the camera back and forth during the interview, or you could invest in an automated electronic accessory that moves the camera by itself back and forth at a set speed. The beauty of these accessories is that they can pan around the subject while they slide, creating a special kind of arc movement that is really difficult to achieve manually. But even a second camera on an automated slider adds an unnecessary risk to your interview. It’s one more thing to set up, it’s one more thing that could go wrong, it could distract your subject or even you, if you’re paying attention to it. And then you have to sync the second angle in post production. So really, the question is, do you plan to show your subject for more than three-to-four seconds at a time during your documentary? If so, then it’s probably not worth trying to add motion to those brief moments. But if your documentary video will be heavily dependent on the interview shot or shots, without much B-roll, then adding motion to your interview can add a significant amount of production value to an otherwise static interview-driven documentary.